The Lucky Dog Regular Dummy has been our best selling dummy for the last decade. They are perfect if you prefer a soft yet durable knobby dummy. I have used them for years with my dogs and they hold up great. We include a dummy rope so you can throw them further. White is an easy color for young dogs to see against most dark backgrounds and on water. Orange is a hard color for dogs to see against most backgrounds and on water. They are recommended for advanced training and for use in "blind" retrieves. The advantage of orange is that it's easy for you (the handler) to see but hard for the dog to see. The half black / half white color setup makes this the perfect dummy for throwing marks with young dogs. The advantage is that the dummy is going to be visible to the dog no matter the background. When you throw the dummy in the air the black will stand out against the light blue sky. When it lands in the water or on land the white will stand out against the dark background. Half and half dummies make it easy to teach your young dog how to watch for game and improve his marking skills. The valve allows you to add water to your dummy to give it more weight. This allows you to throw it further and it makes it sit lower in the water. I strongly recommend that you test them before adding any water. If you over do it, they will sink to the bottom. Test them in your sink or in shallow water first! This is a Lucky Dog regular plastic dummy. It's our most popular dummy that we sell. We recommend these for dogs six months old and up. They are knobby, easy for the dog to grip. They've got a water valve. And like all of our dummies they come with a throw rope. The idea behind the water valve, it pops open. You can add water to it. And what that does is that increases the weight of the dummy. Now, you've got to be careful about that because if you put a little too much water in, it hits the water it's going to sink. The reason for the water valve, you add the weight, when it hits the water it's going to sink lower in the water. It makes it harder for the dog to see. I recommend if you are going to do that that you practice with it in a sink or a tub just to make sure that you have your weight correct before you drop it in the lake and never see it again. White is the easiest color for dogs to see in most situations. We generally recommend that for a younger dog. On a dark background it's going to show up easily. It makes it easier for them to mark. As they get older, we're going to move to orange. Orange is the hardest color for a dog to see. It blends in with almost every background. The idea behind orange is that when you are working on blind retrieves, the dummy is easy for you to see but difficult for the dog to see. That way the dog is required to use your guidance to find the dummy. The third of the lucky dog dummies is the half black/half white. This is probably my favorite of the ones that we sell. Because of the contrast between the black and the white, the dummy is going to show up on any background. When it's going through the sky, you are going to have the colors mixing. On a dark sky the white is going to show up. On a light sky the black is going to show up. When it lands on the ground, same thing there. If you've got a dark background then the white is going to be easy for the dog to see. If you've got a light background then the black will be easy for the dog to see. So I prefer these especially for marking drills. They are much easier for the dog to see. Love the dummies. They are a great price and wear well. I think last order I placed was for around 60, as we hand them out with the ribbons to qualifying dog and handler teams in the field, and in the conformation ring for placements in the field, and gun dog classes at our Annual National Breed Show. "Goes nuts and will retrieve it for hours. Durable and a great value." Dog loves this thing! Whenever she sees it, she goes nuts and will retrieve it for hours. Durable and a great value. "The best! I have used nothing but Lucky Dog bumpers for years. Just the right amount of give"
The best! I have used nothing but Lucky Dog bumpers for years. Just the right amount of give to them, not too stiff. Perfect. "I could buy three of these from Steve Snell at the price of only one from the outdoor superstore!" I bought this to teach my lab puppy to retrieve from the water. We don't hunt, but needed something of quality that I could rely on. I'm tired of 'toy quality' floats that just don't stand up to any real use. This Plastic Dummy did the trick...and Gundog provided the product at a fantastic price! I could buy three of these from Steve Snell at the price of only one from the outdoor superstore! The white (as I read from Steve) is the best for training the new pups- and are easy to see bobbing in the local lake or bay. I've tried almost all water venues and it works great. Heavy enough to throw some distance and good quality to withstand the dogs repeated bite. The rope is secure and never detaches which gives it an extra dimension for the dog to catch and pull if he doesn't want to mouth the whole body, or who's mouth is not big enough yet. The only reason I bought several is the fear of losing them in the water-not of any fault of the float, but if I throw it too far and my pup gives up. This happened to me once in tidal water, but she's since grown up and can hold her own now. THANKS STEVE SNELL for providing quality products for a reasonable price. The knowledgable staff and friendly service is tops in my book! "This is one of the same we use while maintaining/training our Improvised Explosive Device Detection Dogs (IDD) that we utilize in the United States Marine Corps." 1 Labrador and 3 boxers. Hunts. Family pet. I always have liked using these (this style of) training dummies. This is one of the same we use while maintaining/training our Improvised Explosive Device Detection Dogs (IDD) that we utilize in the United States Marine Corps. I also have had the great privilege of adopting a retired IDD. This training dummy, along with the additional color combinations that I received in a extremely efficient and timely manner from GDS, are what I utilize with my IDD Charlie. Its not really work for her now of course, but as with most retired working dogs the maintenance we use to have to do as required is all now play and exercise utilizing her professionally taught capability. Thank you much Steve. They're great for pile work. These dummies are perfect training and exercise tools. Soft to the mouth, yet just firm enough. Attached a little longer rope for more distance. Great value. Thank you. Great bumpers! Easy for my dog to grip, and the rope makes them easy to throw. Works great. The water valve for controlling the buoyancy is a good idea, and it works well. Dummies are great. My dog seems to like the smaller size vs the jumbo size. Currently using for force fetch and all seems to be progressing well. Total value. Came on time like they said it would. We are the envy dog beach. When all the other doggie parents bring overpriced bumpers from Petco - or worse yet, use driftwood - we know we have to keep a close eye on our bumpers or they are GONE! Equal to any others on the market and less expensive. "My pup seems to see these better in the water." My pup seems to see these better in the water. I like to use the orange and black N white ones together. Keeps my dog thinking with her nose. "He really enjoys the lighter version and ability to adjust the air pressure in the bumper." Have had a couple of these in the past, and our dog has worked well with them. He really enjoys the lighter version and ability to adjust the air pressure in the bumper. This low cost retrieving dummy works great and does the job, plus my dog is happy to be in the ocean playing fetch. You can't go wrong buying several like I did. Fast shipping! Great bumper for the price. My Newfs love these bumpers. I've been buying them for years from Gun Dog Supply for use as we train for water rescue. I recommend them to everyone I know who is looking for good, sturdy bumpers and a reasonable price. My labs absolutely love these bumpers. They would play fetch with them all day everyday! Labrador Retriever. Hunts. Family pet. Competes. Easy to throw. Good distance with the rope. Best price of anywhere that I looked. Product is as advertised and of good quality. Great product at a low cost. Have not been disappointed once. Weight, size, and color of black/white is the best. They hold up well to a lot of work. Very sturdy, great in water. Dogs are beating the hell out of them. My dogs love them, even my Yorkie. She thinks she's a Lab. Very durable product. I have two left from my previous dogs.. Over 8 years old. Great dummies. I did upgrade them to heavier lines, allows a longer throw. Downside, my dog is a pup and sometimes prefers to carry by the heavy rope. Have used for a few years. Bumpers hold up, but I lose them. Have owned these in the past, and like the others, this one has not let me down, especially for what it cost. Good quality for excellent price point. These are the only bumpers I would buy. Excellent service -- fast, efficient, and accurate. She loves it better than a tennis ball in the water! Own six Lucky dog retriever dummies. Do double and triple retrieves with the dogs no problem whatsoever. They still look like new. Very satisfied with the product. At the price, you cannot beat them. These work great!! My dog gets super excited when I pull them out for training. They float well, and they are easy to see for my dog. Nice quality and better price and rope than on ones I can buy locally at major stores. Shipped same day and arrived the next even though I chose cheapest option. Top notch retailer. This was a great product. Received three dummies, and the pups love them. It's hard to get them to stop. They will fetch these for hours, even the little one. Thanks guys. This is the perfect tool to help teach retrieves with my dog. I love it! Great retriever toy, but buyers should check the knots on the rope for new purchases since they are sometimes cut off too close to knot and come untied during first dog tugs. Narrow end is soft and vulnerable to chewing dogs. Leaving the product unattended can quickly render the dummy unusable if you leave it too long with the dog to chew on. They are great for a young dog. As my dog gets older (another month or so), I will have to go with the larger bumpers. Great product!! Great website. The customer service was excellent! My dog loves it, and it is super durable. Labrador Retriever. Hunts. Family pet. Needed a bunch of dummies for training. Great value. Great quality and perfect size. Love them. Great bumper for great price! Not too hard, which is good. Great product at a great price. We are so glad we found you. Great product. Rope was perfect length to throw far. Tied an extra knot in each end to shorten for my puppy. Great. The dogs love them! Nice weight. Easy to throw. The dummies are great, and the order was processed quickly as I needed them to start training my 3 month old Labrador puppy. I will definitely use you in the future as I will need other supplies as he gets older. Works really well, and they are durable. These are perfect for my needs. My dog loves retrieving them. He is toy focused and not a hunting dog, but I absolutely love them! My puppy is just 4 1/2 months old and loves retrieving your dummies. They are perfect for our training sessions. Thank you. Works great! The black and white bumpers are great for pushing the dog into deeper cover and helping him be successful. The orange bumpers are great for honing long marks in shorter cover. Bumpers are tough, and stand up to abuse well. Highly recommended! Even without adding any weight you can easily toss these 60 yds. Great product for the everyday trainer. I use this smaller bumper to train my search and rescue dogs for water searching for drowned victims. I use a scent machine to put cadaver scent in the water, and the bumpers are connected to a string, so they can be bobbed on top of the water right in the scent bubbles. Lab and French Bulldog. Competes. These dummies are great. I use them with my Lab while swimming in the Hudson River. The rope allows me to throw it far, and they are easy for him to see and grab. (I always get the black and white one). I've been working with him on diving under the water, and you can change the boancy with these. They are perfect. This is my second round of ordering these. If you don't let your dog chew on them, they last! The original 3 I bought, I gave to other dog owners who also loved them. Since then, I've bought 6 more. Golden Retriever. Family pet. Competes. My dog is only 8 months old. I bought the white dummy. It is easy for him to see it. It's small enough for him to hold. And yet it is easy to throw, even with out adding any water to it for weight. I'm sure that I will be ordering more in the future. I gave this product a 5 star rating due to the fact that my dog thoroughly enjoys training with this product. However, my dog did tear the black and white one apart the first we trained with it, making it useless in the water. But overall great products. I gave this product a 5 star rating due to the fact that my dog thoroughly enjoys training with this product, however my dog did tear the black and white one apart the first we trained with it, making it useless in the water. But overall great products. Lucky Dog Dummies are the best and bonus that Gun Dog Supplies sells them with ropes attached launching. I use both white and orange dummies for lake and land retrieving. "They are made very well and I'm very happy with the quality, speed of shipping and price." I bought a couple of these for my dog as our other dog passed away and I thought he may play with them. He usually only played with his sister. He doesn't seem real interested in fetching the bumper but I hope in time he will. They are made very well and I'm very happy with the quality, speed of shipping and price. "Every item we have purchased has exceeded our expectations." Every item we have purchased has exceeded our expectations. These are great stocking stuffers for your four legged friends. Exactly as expect. Great product. Great product! I like the black on white for ease of marking. Great product and price! "He loves having a special toy to play fetch with!" He loves having a special toy to play fetch with! Plus he can't tear them up! "Bumpers are pretty basic but these are well made for the money"
Bumpers are pretty basic but these are well made for the money and seem to hold up well. Beagles & Labrador. Family pet. "Nice touch to sell them with the ropes included." Love theses bumpers. Not the real hard plastic like some. Have used this brand for years, and they hold up great. Nice touch to sell them with the ropes included. Thanks! "Using Gun Dog Supply is a great choice." My order was processed promptly and correctly. Using Gun Dog Supply is a great choice. Labrador. Hunts. Family pet. Competes. I've used these for years. Very good! "Great for use on land or in water." I wound up having to remove the rope (easy to do), because that was what my puppy was most interested in! (It's a little big for puppy mouths). Great for use on land or in water. Floats great. In fact, mine floated away in a fast current. I'll be ordering another (2 or three). Quality products. Best price around! "My boy LOVES them in or out of the water." I take my dogs swimming, and these toys are the best for encouraging them to swim longer. My boy LOVES them in or out of the water. Great value! My one puppy will chew them, so they are only used when they go swimming. "Best value I've found yet." Best value I've found yet. Why? They're reasonably priced, includes a solid/longer rope to aid throwing, you can buy them individually (instead of in sets of three), and they're much more durable than other white-label bumpers I've purchased at Big Box Outdoor Stores That Won't Be Mentioned. Solid purchase. "These dummy are the perfect weight, and the shipping was very quick." These dummy are the perfect weight, and the shipping was very quick. 3 days and it was at door step! Everything I expected. Great for young dogs. Best deal around! Timely service and delivery when ordering online. Might have to buy another 4. Chesapeake Bay Retriever. Hunts. Competes. The only one I will buy. Versatile, (fill partially with water and you can sink them), 2 sizes, durable (some I have are over 10 years old), and inexpensive. They are easy to throw. There aren't any that are better. A Chessy can destroy anything, but not these. Great product and inexpensive. Fast and easy dealer to purchase from. Solves my needs with training. "These are great for getting my dog to swim and run." These are great for getting my dog to swim and run. She loves them, as do I. "All the dogs at the dog park love these dummies"
All the dogs at the dog park love these dummies and are in competition on who will retrieve it out of the water. "My dog's favorite activity is fetching her dummy in big ocean waves." My dog's favorite activity is fetching her dummy in big ocean waves. I recently switched from orange to the two-tone black and white. She appears to see it better in the surf than the orange model. The white one seemed to get lost in the foam and didn't work well for us. "Love them and LOVE Gun Dog Supply!" These are small enough to carry 6 with you in the car always. Keeps the dogs working, thinking and playing when I have a few minutes to kill. Love them and LOVE Gun Dog Supply! Works well. Does not get hard in extreme cold. Quick service, very informative and everything was as advertised. Excellent. Although I do not hunt, the dog was trained to do so. These are basically his toys. We use them (I've ordered these before) about 350 days out of the year. Thanks. "Great deal on a quality bumper." Great deal on a quality bumper. Very fast shipping. "Great value for excellent product." Great value for excellent product. "Great price, product holds up well." I have all three colors of these, and they are awesome. Great price, product holds up well. On top of all that, they come with a throw cord. Big thanks to Gun Dog Supply for the speedy delivery, great product at a great price, and throw cords. Standard dummy. Price is good. "Good bumpers for the price and plenty durable." Good bumpers for the price and plenty durable. I don't use the small bumpers very often. Normally use the large. They come with a good rope throw attached. I replace it with a stiffer nylon rope that I splice an eyelet into, just a personal preference. Lucky Dog bumpers have been a reliable, durable, and proven performer for me. These bumpers are great! A little hard, but they work! I would buy these again in a heart beat. They are really good quality. Work great. Just what I was looking for. "Great buy for the price." Great buy for the price. Great bumpers! Hold up very well. I love that they come with ropes too. Sturdy and a good product for the price. Very happy. No problems at all. They are great and so is the service and PRICE. Thank you. Use this product weekly at the beach. Have tried many different kinds of water throw toys, and this one is the best. I got all three colors. My 4 month old puppy loves them all. They feel well made and work great! Excellent dummies for the price. Relatively new customer to Gun Dog Supply, but find products are of great quality, prices are good, and delivery is quick. Give them a try. "Love that service is so fast." Love that service is so fast. "Price is good, and real fast shipping." The Plastic Dummy is like all others, but the service with Gun Dog Supply is the best. Price is good, and real fast shipping. "I love the plastic Dummy." Steve, I love the plastic Dummy. Thank you for you quick delivery. "My products always arrive quickly." You all our very helpful. My products always arrive quickly. "This was exactly what I was looking for, and the price was right!" This was exactly what I was looking for, and the price was right! I bought one of each to see if my Labs liked one better than the rest, but the colors didn't seem to make a difference. We'll see how it goes when I get them back in the ocean in the spring. The only problem I had was I forgot to take it away from one of my labs when we got home, and he was outside with it and tore the rope off of the end. It's not a chew toy, and I knew that -- my fault. Other than that the dogs love them, and they're easy to throw. My labs love them. They know what they are before I even open the package! I love that Steve and his crew have already put ropes on them too! Always top notch! "Works like a dummy should!" Works like a dummy should!!!! "Great product that is very durable!" Great product that is very durable! Great job received them in short order. Exactly what I needed. Thanks. "I found that was the best price and quality on the market!!" I found that was the best price and quality on the market!! Awesome customer service as well!! "They are long lasting for fun water fetching." They are long lasting for fun water fetching. My dogs love these, and they are easy to throw and easy for the dogs to see in the water (especially the white ones). Can't go wrong with anything Sportdog! Great products good price! I, and more importantly, my dogs love these dummies. I've purchased these 3 or 4 times over the last 5 or so years. They occasionally get lost, and get chewed up if I'm not paying attention, but they are the best dummies I've seen. The throwing rope is essential, and it is nice to have it included. For some reason, the black and white is the favored color, although I do like throwing the bright orange in the snow. Great product! "Bought two, and they are great." Bought two, and they are great. I didn't realize the white and black were best for dog's eyesight, so I'm glad I came here. I did remove the rope and replace it with a looped one but that's because I pick it up with a hiking stick. "These folks were super fast and very good product." These folks were super fast and very good product. They came highly recommend from very many friends. Excellent service. "Great price on a good product." Great price on a good product. These are long lasting in the Arizona sun and as always, customer service is the best! Good quality and value. I have recommended them to friends. This was a great purchase. It took my dog a little while to understand what the dummy was for, but now she gets very excited and wants to work anytime I bring one out. I have two buckets full of white and many red for training both dogs so I can set up several at once which saves time and energy. Durable. Good length rope makes it easier to toss. The price is great and it's tougher than most, but two labs can still get it to pieces eventually (as they probably could most anything). The first thing to go was the valve, but with the hole there, it still floats fine as long as it takes for them to retrieve it from as far as I can throw it into the pond. Gundogsupply customer service appears to be unbeatable. I expect to be buying again. Our lab, Joey, loves to retrieve these dummies. They are easy for him to hold in his mouth. Great quality product. Exactly as described. Good size, and works well on land or in water. Great customer service, and you can't beat the informative product videos on the website. I usually use the jumbo size for my adult lab, but I picked these up for our lab puppy. They are the perfect size and I ordered enough to teach baseball retrieves. Product already in use. Excellent dummy for dock diving. Not too light or heavy. Well balanced, easy to throw. Great product and very economical. Arrived very quickly too, great customer service. Would buy from Gun Dog again. They have worked wonderfully, and they haven't disappointed me. They work very well. This is the same dummy that his trainer used. Works very well. Exactly what we wanted. I thought when i purchased this with the avery bumpers that this would be my beater training toy for dock diving. I found out that my entire family and dogs like this better. Very durable good grip and dog seems to track it very well in jumps. Definitely recommend this for ultimate air dogs. Our dog is loves this product just as much as we do. The black and white is perfect! "It's great quality and got here quickly." Training on this one. It's great quality and got here quickly. Excellent for the price. Don't waste your money on all those other high dollar bumpers. "Really nice product with a good price." Really nice product with a good price. If you need training bumpers, I'd look at these. Good quality. "Easy to throw, and dog loves to retrieve them." Easy to throw, and dog loves to retrieve them. "Great product and comes with a rope." Great product and comes with a rope. "Awesome company, I will continue to do business with them." Great product and shipping was excellent. Awesome company, I will continue to do business with them. Thanks for what yall do and can provide. "Great product and fast shipping." We use the black/white lucky dog bumpers for big air jumps in Dockdogs. Both of my dogs love this bumper. I think the visibility is perfect against the light blue water of the pools. They are also able to easily track the bumper in the air. Gun Dog Supply is my go to spot for all bumpers that I use!! Prices are very fair and shipping is SO fast!! I am so happy to have found your wonderful company!! Can't beat this product for the price. It is impossible to beat this bumper, especially for the price. Thanks Steve. Perfect size dummy for my puppy to begin training. Wish orange was in stock. Great bumper. My lab loves all 3 dummies. Great for practicing water retrieves. The rope is sturdy and allows the bumper to be throw quite far. They float high in the water for the pup to see them well. Solidly made. Holds up well to lots of training on the ground and in the water. Gun Dog Supply ROCKS! The BEST PRICES and QUALITY! Highly recommend. Works great and the pup loves it. My go to rubber dummies. Great price, lasts forever. Love the valve for adding water for extra weight. I really like them, I will order more. Use these on a daily basis! Great product at a great price!!! I like the product but I wish you could get some that are not made in China. Own about 8 of each color, Works great. Really holding up to a lot of work, will definitely buy again when or if the ones I have wear out. These dummies hold up great! I have been using them for years. I love them and my dogs love them! Need I say more? Very durable and floats well. The best throw and retrieve trainer that I have found (and I have tried many). Just as great as the expensive ones! Perfect product for training your dog. I would recommend these to everyone. I've bought plenty of these, and they last a long time. Love doing business with this company! Fast shipping and very reliable prices! These are great! The dogs love them. I Have the black and white dummy. It's a great price and I couldn't pass it up. I came for an electronic collar but picked up one of these because I can never find one when I need one. I have bought several of these, my dog loves to retrieve these for training and play/exercise. They are very durable and love the valve to increase weight by adding water. Great product for a great price! I love the long rope on it. Came with the ropes and that is nice .They are just what I ordered! Good value. This is a toy for my dogs. It takes a while for them to destroy it, and the price is good. Very durable construction for a great price. Very good quality for a good price. Great and inexpensive bumpers. The black and white color is perfect for a nice flash in air for good viz. Plus, the black helps in the snow and white helps on grass. An all around great bumper for the money. Great dummies, and they don't hurt the wallet! All the dogs at the dog park love to chase their dummies in the water! They are the best for the money. My dog is 8 months old and did not like the taste when he was 5 months old, but has since got used to it and loves to retrieve them. I have purchase 1 dozen of these to train with along with several other items. I will continue to do business with GUN DOG SUPPLY based on my limited experiences as they have been solid dealing with so far. Great product, great price and love that they come with the rope. Haven't brought my puppy home yet. I'm sure this will be an excellent product! The dogs have enjoyed retrieving their new dummy. I like that string was included. Buy with confidence!! There were many mixed reviews some of people saying their dog destroyed these dummies in minutes. I am not sure if they were giving them as chew toys or what, but if used as intended these dummies are very functional, durable, and just the right weight. The SportDog dummy is a true value. It is durable, and I can toss these things a mile with very little effort. GREAT PRODUCT! Durable. Has enough weight to throw a pretty long way with the throw rope. Would recommend. These are perfect for the price. My dog goes crazy when he sees me grab them. The dummies are great. I like the black and white, as he seems to pick up that color match better working in the field. Just remember to not let the dog chew on them, as the are not indestructible. Awesome item and great price. We had problems with the Post Office, but Gun Dog Supply worked wonderfully with us to get it sorted out!!! The workers were extremely nice and helped us through our little Post Office problem. And our dogs love the dummies! These two dogs just love to work with these dummies, especially the black and white. This was my third order because we work with them every day and use many of them at a time as the dogs like for me to hide all of them and then hunt them out as well as retrieve them. I think the two would go thru withdrawls if I were to not have these dummies. We just think they are great. Great product! Well built, but keep in mind these are not chew toys. They are excellent for retrieving and light play, but my lab chewed one to pieces when left alone with it for an hour. Bought the black and white version. Pup seems to pick it out against the sky background. Waiting for winter to see how well it works in snow with the black contrast. Like the feel of the throwing rope. Easy on hand and good distance. Have not used the valve to add any weight yet. Top quality. Great for our training with our lab! Sturdy and decent weight for dog and throwing. Has valve to add water, which is a nice added feature. I am not using yet. 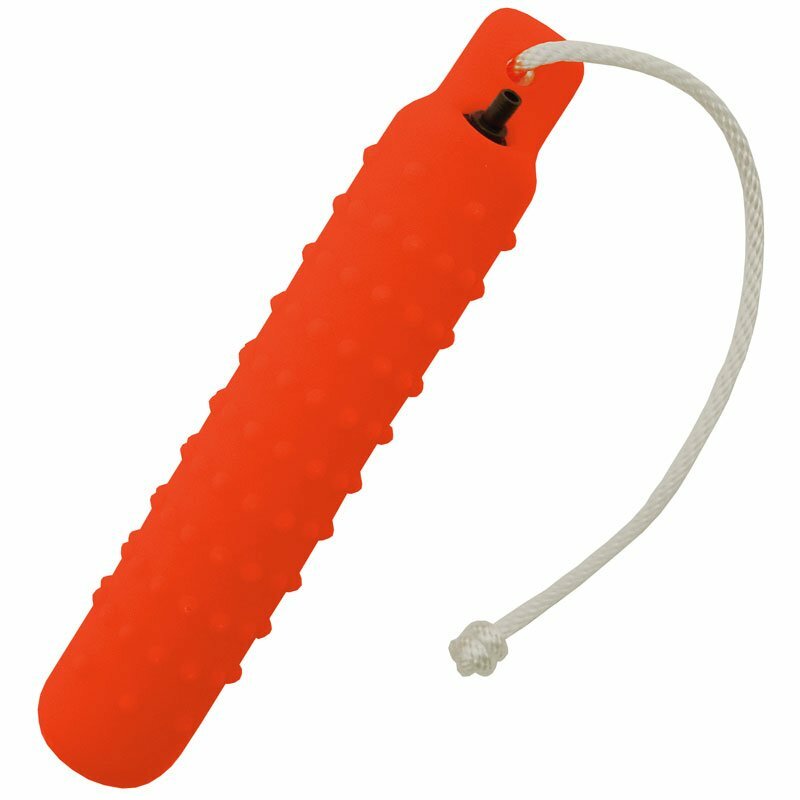 I compete in Dock Diving with one of my Dobermans and wanted to be able to try Speed Retrieve with her next year, so bought 4 of these. She wasn't sure at first about them, but loves to swim and HAD to play with these, so now she loves them! I think they are easier for her to see in the pond when swimming and easier for her pick up out of the water than the Aqua Kongs we were previously using. Thanks, again, for carrying great products and at reasonable prices! Steve, once again you guys are the best. An excellent product! I bought a cheap one from Bass Pro, and it lasted about 15 minutes. But this SportDog Brand Dummy from Gun Dog Supply is top notch! I use a lot of bumpers at one time so I don't have to reload continually for each dog while training ie: double tee and blind retrieves. It saves a lot of walking. My lab is 6 months old. I am using your items for training and exercise for my dog. Best bumper I've used for starting my dogs before sending them off for more in depth training. Price won't break you either. Great bumpers for starting puppies. Prompt shipment; quality product; no problems whatsoever. chocolate Labs. Hunts. Family pet. Competes. Stella loves these new black and white bumpers! Very nice quality, haven't used it with all my dogs yet. Been looking for this for years and my dogs love it! Best bumpers I've used! Stay semi soft even in freezing weather. "My young Chesapeake loves her new bumpers and they are helping her control the chewing urge." My young Chesapeake loves her new bumpers and they are helping her control the chewing urge. A very durable product. "Great price for a good training tool." Great price for a good training tool. I would buy more in the future. My dog loves playing fetch with these and I'm not as concerned with her destroying them as I am with the mallard duck I have too. "For a little over 4 dollars a piece you can't beat them." They are still at home in the original box. I looked them over. They appear to be good quality. The added throw rope is a bonus.. For a little over 4 dollars a piece you can't beat them. "Using these to train my puppy." Using these to train my puppy. "Works well for me and my family." Works well for me and my family. They get used sometimes twice a day. "Bumpers are perfect for training." Bumpers are perfect for training. "Perfect for my 5 month old pup and the older dogs he's around." Perfect for my 5 month old pup and the older dogs he's around. Great weight for throwing retrieves. "They are very durable and perfect size for our young 10 month old female lab." We ordered three orange dummies. They are very durable and perfect size for our young 10 month old female lab. Plus with the attached rope, they are easy to throw. "These dummies are great. 5 month old pup loves them." These dummies are great. 5 month old pup loves them. They are a bit on the smaller side and softer than a lot of dummies, so they're perfect for a younger dog. "I think it will be fine. But she is only 12 weeks old and it is still too big for her." I think it will be fine. But she is only 12 weeks old and it is still too big for her. She tries to pick it up, but it is a struggle. "It's Shadow's favorite bumper for DockDogs." It's Shadow's favorite bumper for DockDogs. Works well and performs as advertised. Have purchased the black and white model based on the review/explanation on the website regarding visible colors. My dog will watch it fly and can locate it in thick grass. He usually sees it from 10-12 feet away. Better than the first canvas dummy I had purchased. Wish it was American made, though. Great product, my dog loves them. Great company to deal with, no problems at all. Good product, great company, timely delivery, and will help with any questions or issues. Fair price. Works well, good training tool. Black Labrador. Hunts. Family pet. Excellent bumper for the price. Recommend offering them in groups of 5-10. The only brand I buy when it comes to dummies. My dogs love them. Plus they are easy to toss. Good product for the money. Great bumpers at a great price. We had one of these throw dummies before and she loved it so much. Lost it so we had to find some more and thankfully we did and she's loving them again. Great product and thanks again. Great product. The video helped me decide what color to use. I have a Lab that loves to chase things but not so good on the retrieve part. She is doing much better now that she can track the black and white dummy easily and is getting better at bringing it back. Thanks. The dummies are working fine. I bought these same bumpers from you 5 years ago and I've lost them. They were not wore out. Great quality and dogs immediately took to retrieving with it. Would highly recommend and purchase again. "Best toy ever, use it for everything, floats, throws nicely, easy on their teeth for tugging!" Best toy ever, use it for everything, floats, throws nicely, easy on their teeth for tugging! Hands down my go to reward/toy for adult dogs and puppies!! Chessie. Hunts. Family pet. Competes. I use all colors of these in my swimming pool on a nearly daily basis. They hold up well and do not need to be replaced until and unless my dog chews the ends off. I have not had to order any recently because they last well. They seem impervious to swimming pool water/salt/chlorine/sun. "I use them everyday and haven't had any issues with them." I have been using these dummies for a couple months now, and I would definitely reccomend these to anyone looking for a quality dummy at a very reasonable price. I use them everyday and haven't had any issues with them. Yellow Lab. Hunts. Family pet. Competes. "I have used these bumpers for two years now and they still work great!" Labrador Retriever,Beagles. Hunts. Family pet. Competes. I have used these bumpers for two years now and they still work great! They have great durability and can take the abuse from daily use. There are plenty of other brands of bumpers but for the Lucky Dog gets the job done and doesn't hurt the wallet when your buying numerous bumpers.The only thing that happens is that one or two out of a dozen bumpers the valve breaks off over time and therefore it can not be thrown into water because it will sink. These bumpers are great. They are the perfect size and weight . As well, the throw ropes are the perfect length which allows for greater throwing distances for marking exercises. Chessepeake Bay Retriever. Hunts. Competes. I have used this for years and many of the the guys I train with do as well. They are excellent. I have no complaints. German Shorthair Pointer. Hunts. Family pet. Competes. "I really appreciate the great service!" Labrador Retrievers. Family pet. Competes. I really appreciate the great service! Curly-Coated Retriever. Hunts. Family pet. Competes. Have also bought the same dummies for friends. Well it was ok until kids left with pup and he chewed it up... The 2nd one the valve failed so takes on water. But fo the price. All is good! "Dogs seem to love to retrieve." Chocolate Lab & Btittany. Hunts. Family pet. As advertised. Easy to throw long distance, float well and dogs seem to love to retrieve. "Durable, throws easy, dog works with them well." Durable, throws easy, dog works with them well. If made in USA then even better! "We use them for exercise/play." Love the value of the Lucky Dog Dummy! We use them for exercise/play. And they are lightweight, so throwing them for hours (on and off!) is tolerable for the humans! Thanks for stocking such a great product. "Perfect size and weight for my young dog." Perfect size and weight for my young dog. Right now, it is easy to find in the snow! "Bumpers work really well in low light conditions"
"My dog loves her new toy." My dog loves her new toy. Puppy retrieve these dummies at 8 week old. "This is my Brittany's favorite toy." This is my Brittany's favorite toy. I have 4 orange ones now. One is lost in a couple of feet of powder! We'll find it when the snow melts! Excellent for young and older dogs. Very durable. Great quality and super quick shipping. Exactly what I needed. Great product. "The price was the best I have found." I like the fact that there is a valve in these dummies. The price was the best I have found. "Your customer service is exceptional." Your customer service is exceptional. "Throwing the dummies for the dogs is a great way to keep them in shape and burn off some energy." Throwing the dummies for the dogs is a great way to keep them in shape and burn off some energy. I've been using the Gun Dog dummies for over three years and recommend them highly. Good quality. Well built. Dogs love to retrieve. "My dogs love this as their fetch toy in the pool." My dogs love this as their fetch toy in the pool. Lasts a lot longer than the others I have used. I train dogs every day, and I need plastic bumpers I can depend on for repeated use day in and day out. Great bumper. Throw rope already attached. Wouldn't buy any others! Durable material. Works great on the water. It works very good. Thanks Steve. "They are great. Just as ordered"
They are great. Just as ordered. Wondering if i should have bought the canvas dummies though. "Hold up great and very economical." Yellow Lab. Hunts. Family pet. These dummies hold up great and are very economical. I highly recommend them. "Great product... no problems at all"
Weim/ Vizsla. Hunts. Family pet. "The rope is just the right length for nice long throws." Golden Retriever and Flatcoated Retriever. Hunts. The rope is just the right length for nice long throws. "Good rope. Holds up well"
"Been using these for years, and rarely have to replace for wear & tear, Usually they get lost." Been using these for years, rarely have to replace for wear & tear, usually they get lost. "I like everything about it. And the price, especially when you have sales on, is very good." I like everything about it. And the price, especially when you have sales on, is very good. Wish the rope was a little larger. It would be less likely to come out of the eyelet of the dummy. The dummy is holding up great! "Great fun for the dog"
Great fun for the dog, she loves it!! My girl is going to be 7 this year, and the only bumpers that don't look like new are the ones the other dogs in the house get hold of and chew. The ones I can keep for just us might get dirty, but are as good as new. "Great product. Dogs love them"
Black Lab. Hunts. Family pet. Competes. Great product. Dogs love them..
No problems. Great as always. For the price, you cannot beat these. Very durable, just perfect. "For the money you can't beat Lucky Dog Dummies!" Kate,BlackLab;Flo,Choclate Lab and Lucy the blonde Cocker and boss. Hunts. Family pet. For the money you can't beat Lucky Dog Dummies! I have both sizes and there great. The best part is I can buy them online from gundog and have them in a couple of days. I have purchased 6 different brands of dummies, and this was one of the better ones. Not the best one, that is "Soft Mouth Trainer". It has stayed pliable and did not become brittle or crack like many others. Nothing to dislike. Great dummies. It has worked perfect. We have used it hard in all kinds of conditions and it still looks nearly brand new. It is a perfect size and weight for throwing and carrying and easy for Zoe to see, even in the water. All the other dogs at the park try to steal it from her! It is very good value from a price and performance perspective. "I love doing business with Gun Dog Supply!" I love doing business with GunDog Supply! "Very durable throw, great color, very bright." Very durable throw, great color, very bright. "Great bumpers at a great price!" Great bumpers at a great price! Many Many marks and alot of pile work has been used with these dummies and they are holding up great. "I would highly recommend these." I have purchases tweny of these bumpers this year for training my 8 month old lab. They are durable, you can throw them a long ways, and they are in the right price range. I use these bumpers 20-22 hours a week with my pup. I have yet to have one break, no rope troubles, and no punctures. I would highly recommend these. I have them in white, white/black, and orange. "This is one of our dogs favorite"
Our dogs love to play "fetch" in the water....they are also very hard on their toys since all four dogs like to play tug-of-war and with their strength, they can destroy toys quickly. This is one of our dogs favorite - we keep two in the boat and two in the back of our jeep for anytime we are at the "water" playing. We use the dummy for playing fetch at the beach. It's easy for me to throw and my dogs love swimming out for it it. The other dogs at the beach seem to love it too. We even had a Mastiff swimming in the ocean after it. It was his first time to swim and his owners were thrilled. "Very durable and float well even in big ocean swells!" Duck Toller. Hunts. Family pet. Very durable and float well even in big ocean swells! Even great for the dog park!! "The bumpers from Gun Dog Supply is a bonus because the throw rope is already on the bumper." Over the years, I have bought a few different brands of bumpers. I like Lucky Dog plastic bumpers the best. Easy for the dogs to pick up and carry, and not to expensive. Another brand I own is so hard, that the hard charging young dog gets a bloody tongue when we use that brand in our drill work. Also getting the bumpers from Gun Dog Supply is a bonus because the throw rope is already on the bumper. I think I have bought around 6 dz of this brand of bumpers and highly recommend them in Retriever training. "I like that they are solid enough so that my lab (who has never been hunted) can retrieve and bite down without ripping them to pieces." I like that they are solid enough so that my lab (who has never been hunted) can retrieve and bite down without ripping them to pieces. "Easy to throw, and holds up to all the abuse that the dog and I give them." Exactly what I expected. Easy to throw, and holds up to all the abuse that the dog and I give them. "Has held up well to heavy use." Has held up well to heavy use. Labs. Hunts. Family pet. Competes. "These are great bumpers at a great price!" These are great bumpers at a great price! Lab. Hunts. Family pet. Competes. No problems. Have run plenty of blinds with them. The rope is sturdy and does not hurt your hand to throw. The bumper is rugged and stands up to abuse. Jack Russell terrier. Family pet. Works excellent for teaching in the high field grass of the rocky mountains and for working with flowing rivers. I like that it's soft for the dog's to pick up, but it doesn't take long for them to chew a hole in one. I bought these with a certificate I won at raffle and donated them to our clubs raffle. As far as I know they were a hit! My pup loves to swim and her favorite toys to fetch are her orange dummies. "Excellent quality and highly recommended." The softness of these bumpers makes them preferred for running field drills. Both of my dogs are enthusiastic agressive retrievers who love to run drills. My older dog (GMHR) fractured a lower canine tooth on a hard rubber bumper a year ago requiring a root canal. These soft rubber bumpers are much more forgiving and safer to use. Excellent quality and highly recommended. The service from Gun Dog Supply is also excellent. Labrador / MIx w/some pit. Family pet. I previously purchased LL Bean plastic dummies for my dog's exercise. The LL Bean throws are inferior to the ones from Gun Dog Supply as my Pit Mix has yet to chew through the dummie and start to rip it apart. I will continue to purchase from Gun Dog Supply. Gun Dog Supply has great products, including a leather collar I purchase for my Pit. I don't like that she left it in the field and it doesn't have a gps! All of the Retriever Breeds. Hunts. Family pet. Competes. I have 12 of them &amp; I like them very much. Our club has 4 dozen &amp; they work just fine. I would buy them again with out even thinking about it. And there is no telling how many the other members own. Great price, good dummy. The ability to fill them with water is awesome and allows you to adjust the weight and buoyancy of the bumpers as your dog grows. I was so pleased with them I put in a second order to replace my "other" dummies. German Shorhair Pointer. Hunts. Family pet. I've tried two other brands and they both came apart within a few weeks of training. This particular one has lasted me six months of hard use. I've had a set of 3 of these for over a year and they are as good as it gets, especially considering the price. The rope starts to wear down over time and may require an additional knot to keep it in tact, but overall a great product that will stand up to anything you and your dog can "throw" at it. Best price online! I wish I had seen this product and price when ordering my SD-400 e-collar and blank gun. "Great toy for any dog that likes to fetch. Great price too." Labrador and Cattle Dog. Family pet. Great toy for any dog that likes to fetch. Great price too. The only thing I would say could improve this item is to use a better quality of rope. I replace the rope with mountain climbing rope, and it's easier on my hands. I get blisters from the rope that comes with it. I have used this with numerous labs but also with my Queensland Heeler who also likes to fetch. I live at the beach so I like the orange model best because it shows up in the waves better. I don't know why pet stores don't carry this in my area, but am very happy to give this site my business as they are excellent at customer service and price both. Love these. Hold up better than many other brands. The little stopper tends to fall out, but they can handle some biting and pulling when the two dogs go at them. Easy to throw and of course the dog loves them. "Throw well, durable, and affordable." Chocolate Lab. Hunts. Family pet. Throw well, durable, and affordable. Bought several of these in black/white and orange and they've been riding in the back of my truck and in the sun, rain, heat, and snow and used with the dog several times a week for over a year now and show very minimal wear. chocolate lab. Hunts. Family pet. Competes. Love the way that the bummpers hold up. Also I like the way the bumpers throw. Dont need as much help cause i can throw the bumper far enough for a good retrieve. "Love these training aides / toys"
Golden Retriever. Hunts. Family pet. Love these training aides / toys - but if left with them they chew the top of the bumper off with the rope. Excellent value and softness. Never had a single refusal. Use the training dummie all season long in the lake, it is very durable holding up to all the abuse and teeth. Great dummy The rope had to go, too much fun to play with for my Dog. I liked the rope to use for throwing when the dummy got all muddy but the dog had too much fun with it during training time. chesapeake and labs. Hunts. Family pet. Flatcoated Retriever. Hunts. Family pet. Competes. Great durability. I only have to replace them when I lose one. Big yard to throw these...dogs LOVE them! Sometimes they decorate the trees, that's why I order so many. Then when they finally fall out of a tree- my dog thinks it's a new one. Not used for training- these dogs need exercise and this toy is the best! The Lucky Dog dummies are very well made, tough but soft enough not to harm the gums. My dog is very fast and often manages to catch the dummies. If the material is very hard he ends up with bloody gums. These are perfect. As with most dummies/bumpers they are not made for chewing so a determined hard chewer could do damage to the dummy if not monitored. Mine have held up very well. Steve Snell still has the best prices around. I use them 3 - 5 times a week and they have held up very well. Some are little faded, but still orange. He loves them so much I can't get them away from him. He will reterve but not let go! He also chews the string/top off them. This was really fun until the dog chewed it up. Would be nice to have one made of that indestructible plastic, but for now I just use it for throwing only and put it up when I\'m done. As with the white bumpers, the rope, weight, and durability of the Lucky Dogs bumpers cannot be beat at anything approaching a competitive price. Labrador and 3 boxers. Hunts. Family pet. Excellent product and services from GDS. I mentioned quite a bit about the white version of this product and feel the same and all applies from that portion I wrote about. I will say it is very disappointing seeing the Made in China sticker on the dummy. That is painful to me to pay for a product that is made in China or otherwise. I normally do my best to purchase products Made in the USA...the one and only. Thanks again Steve. "Great value for the price!!" Great value for the price!!! The plastic top where the string was connected was the first part to break and the toy became close to useless after that. Otherwise we got a lot of hours of play in with it and my dog absolutely loves it. A great toy. My dog loves to retrieve in from the water and hold it in her mouth when we swim together. The rope is very handy for a good toss. "It is our dog's favorite toy!!" It is our dog's favorite toy!! She would die without it. This is great for use in wet or snow. Indestructible. Did need to loop the string. He kept tripping on it. But he loves his new bumpers. I was using it today. My dog loves it and automatically retrieves it and brings back to shore. We had a dog today who had never been swimming and she got the gist of it right away and after sharingI it once with Devon, my dog, she started to retreive on her own. Great fun ! The dummies have held up very well. I would recommend them to my best friend and to other people. "I have found these to be one of the better training bumpers that I have tried." Training dogs on a daily basis requires equipment that will last. I have found these to be one of the better training bumpers that I have tried. The only bumpers I'll ever use. "I would highly recommend this product." We have a black and a yellow Lab. The black one is a fetching fool. She fetches her bumper constantly on our daily morning walk. Excellent quality toy. My most recent purchase of these bumpers is the second time I ordered them because the first one I bought got lost. I would highly recommend this product. "These are a GREAT training tool." These are a GREAT training tool. Orange is the BEST color for training your dog to use their nose, since they are harder to see in medium to high cover. These are great to mix with white bumpers on drill, like wagon wheels, lining drills, ladders, and blind retrieves. I would recommend you have at least eight in your bag. The Lucky Dog bumpers are easily the favorite of all retrievers, wanna test it ? put 3 different brands out for pile work and the Lucky Dogs are always the 1st to come back. Soft design stays pliable even in cold weather. This is the only brand I would buy. The Remington brand is too hard, and the foam ones get really dirty and fall apart. I keep these outdoors through all types of weather and they still are like brand new. The rope is an added bonus for teaching to retrieve longer distances. Chesapeake Bay Retriever. Hunts. Family pet. Works Great. I really like the rope attached, it helps to throw it long distances. Boykin. Hunts. Family pet. Competes. Zeus knows we're going swimming when he sees the dummy come out of the truck. Good quality has stood up to a lot of abuse. What's not to like? You can spend a lot more money ... but why? For two years our lab has retrieved this dummy out of water, tall grass, thick brush ... it just keeps coming back! Hungarian Vizsla,Choc. Lab and Americam Bull Dog. Family pet. Competes. Over the years I have trained with several throwing dummies, but they were no where near the quality of these dummies. "They are perfect for my needs." Works as intended, and of good quality. They look good. Dogs mark them well. I can throw them a long ways. They are perfect for my needs. "Great products at a fair price and timely shipping." Black Lab. Hunts. Family pet. Great products at a fair price and timely shipping. "These are great dummies to work with on a daily basis." These are great dummies to work with on a daily basis. These are great dummies. I use them with my Lab for Dock Diving/Water Fetching. He seems to see them much better than other dummies I've tried. I have three of these and will buy more of them as needed. Great bumpers, and you can't beat the price. It is the dummy the trainer recommended, and I find the design to be working well. It is light and has protrusions that give the dog a good feel and hopefully a soft mouth. Works great. I add water for extra weight for throwing. Constructed well. Should last for several years of training. Great. It is all a bumper needs to be and then some. "These bumpers have held up great with no sign of wear." I ordered three of these bumpers from Gun Dog Supply because I was tired of using the cheap academy and Bass Pro brand. These bumpers are quality. I have two labs, one that has been professionally trained and one that is strictly the wife's dog. Needless to say the wife's dog doesn't have the softest mouth. These bumpers have held up great with no sign of wear. Shipping was extremely fast with GDS and emails were promptly replied. I will certainly be using Gun Dog Supply in the future! Bought this to begin training our pup. "Easy to throw, gets plenty of distance, and cleans up well." Easy to throw, gets plenty of distance, and cleans up well. My dogs love them. I use the bumpers as a reward when training obedience and agility. They are soft enough that I can toss them for the dog's to catch, as well as easy to throw for them to retrieve. Lets face it, bumpers are almost a consumable item. They get lost. You leave one on the top of your van or the bumper of your truck. I've even had them stick to the bottom of the ponds and run the dogs through in hopes of knocking it loose. With that being said, you don't want a cheap bumper where the throwing cord rips through the hole at the top, or becomes hard and cracks. I try different bumpers, but keep coming back to Lucky Dog bumpers. I'm sure I'll lose some more bumpers, but the cost is reasonable, and they are durable. Buy more than you think you will need. My dogs like to play keep away with the Dummy. It is soft enough to be inviting, yet tough enough to withstand rough play. Great price, fast shipping! They work great, but I personally thought they were the large bumpers, but very happy with them. "Great value for the price!!!" "These have been a favorite of mine for years." These have been a favorite of mine for years. Although my dogs are retired now, we still do fun marks for activity. They are firm but not so hard that they bother my guys mouths. Have always been a fan of the black and white. "Always been pleased with my orders." Always been pleased with my orders. "Great product...very durable, cost effective, and good for all uses." Great product...very durable, cost effective, and good for all uses. I have worked with multiple bumpers, and for the money you cannot go wrong here. "Consider them a disposable training aid and have at least 6 of each to train to dogs." White for marks, red for blinds. Consider them a disposable training aid and have at least 6 of each to train to dogs. "I love all my lucky dog bumpers." I love all my lucky dog bumpers. I tell my puppy buyers to go to Gun Dog Supply for their needs. HOWEVER, I am not happy to see that they are made in China and wondering if this is a good choice for something my dog puts in his mouth. These bumpers feel different from bumpers in the past that I have purchased. "The Lucky Dogs have good weight and balance that allow good control for throwing long or short." The Lucky Dogs have good weight and balance that allow good control for throwing long or short. "Great product at an extremely affordable price." Great product at an extremely affordable price. I am not a trainer. I have an 8 month old Black Lab that I bought these for just to wear her out. She loves to fetch in the river we live on and in the pond. These are perfect! She can see them and her "game" has dramatically improved since using these....versus a stick. :) Would buy these again. In fact, probably will! "Durable and easy to clean." Durable and easy to clean. I like it. "Lucky dogs are my favorite!" Lucky dogs are my favorite! Great training tool, easy to handle great for pups as well as adults. Great toy. Priced right. I purchased three, and my dog loves them. She's chewed through one (still a pup). I filled one with water and put it in the freezer, and she loves them. I can see where they'd make great training tools. "I think these are the best!" I think these are the best! "Top quality at a good price!" Top quality at a good price! "Excellent product and services from GDS." Wish you would give a little price break when ordering 6 or more! Great product! Labs-. Goldens - Cheasapeke. Hunts. Family pet. Competes. I have used these bumpers for some years now, & I train every other day & two days a week with a Group, of about 20 dogs They have been GREAT!!!! Just the correct size for a 5 month pup to get on track. They work great. I have already told people about dummies & the prices. "Excellent product and great service"
Excellent product and great service, thank you! 10 pound puppy can retrieve it. Great dummy - seems to hold up well. So far so good. Doesn't take too much motivation to get a Lab fetching, especially when water is in play. "I've ordered multiple times from here, and the delivery is super fast and the people are always friendly." Can't beat the price or the service. I've ordered multiple times from here, and the delivery is super fast and the people are always friendly. Thank you. Same great bumpers, great price and quality. Great product. Well made. A great deal of junk out there! "They have worked great for me. I use them every day." They have worked great for me. I use them every day. Great dummy. Like the adjustable valve. Very durable rubber and rope material. Good value. My dog lost the first one after three throws. Current carried it down fork in river. We will try their second one soon. "My GSP is super responsive to the white Lucky Dog Plastic Dummy"
My GSP is super responsive to the white Lucky Dog Plastic Dummy, as well as the Black and White Dummy. It's pretty bomb proof if you keep other dogs away from it that don't realize it's not a chew toy. I can tell that it is my dog's favorite retrieval work tool. "Easy to throw and easy feel in their mouth, great training tool." My dog loves them; he wakes me early Saturday morning reminding me to go to the beach, so he can retrieve his dummy. Easy to throw and easy feel in their mouth, great training tool. "Great training and practice tool, and the valve system is great for water training!" This is my second order. The first one wore out from daily use (over a year old!). Great training and practice tool, and the valve system is great for water training! "The attached ropes, weight, texture, color, and durability are excellent and the price is lower than competitive brands." The attached ropes, weight, texture, color, and durability are excellent and the price is lower than competitive brands. Easy to see. I won't get lost in the fall leaves. "I have had them for over a year, and they show no sign of wear. I have had other brands, and they started to crack in 6 months." These bumpers have held up very well. I have had them for over a year, and they show no sign of wear. I have had other brands, and they started to crack in 6 months. "Had these for five years, and there is nothing wrong with them." Had these for five years, and there is nothing wrong with them. "Bumpers have worked better than Avery's version thus far." Bumpers have worked better than Avery's version thus far. Hopefully the plastic won't get brittle in the colder weather this winter. "The throw rope is great for getting it out into the lake." It's just the right size for the Golden's mouth. The throw rope is great for getting it out into the lake. Good success overall. The valves do pop out easily and are lost, which allow them to take on water when working water retrieves, but I just generally keep a couple of good ones for that. "While I don't recommend using it as such, it has lasted through numerous tugs of war when other dogs decide they want to play too." I wish the rope was just a little thicker, as that would be more comfortable when throwing the dummy. The dummy works great and is easy to spot. While I don't recommend using it as such, it has lasted through numerous tugs of war when other dogs decide they want to play too. "We recommend this for dogs who love swimming and retrieving." The plastic dummy is a bright orange, easy to see in Long Island Sound, and the bumpy surface appeals to our puppy. It floats well, and the string is useful to us. We recommend this for dogs who love swimming and retrieving. "Good product for the cost." Good product for the cost. The rubber is a little soft, so that is a plus. "Your customer service is 5 star too." Your customer service is 5 star too. Love these things. My dogs are obsessed. They are wonderful. So fun to play with them and watch them be so happy. And this website is great. Extremely fast shipping. Great prices. I'm a second time buyer. They are wonderful to deal with. Thank you so much from me and my dogs!!!!! Good quality. Can't beat the price. "These are the best products I have found for the money!" These are the best products I have found for the money! "Excellent bang for your buck." I like these bumpers, because they are an excellent bang for your buck. They hold up really well in water, and they are the right size for training. I can fit about 20 of them in a 5 gallon bucket. This is how I transport them to the field. P.S. Thanks for the Gun Dog Supply hat, I've been wearing it a lot. P.P.S. I have been working in the Permian Basin all month for the oilfield. I had some wells out in Loving County (West of Kermit) and I saw tons of blue quail. I know y'all go out there and hunt sometimes from Steve's blog. It should be a good year. Didn't see any bobwhites, though. German wirehair and Black lab. Hunts. Family pet. It's a good bumper for short money. Quick delivery and nice product. Belgian Malinois. Family pet. Competes. She was able to break through the rubber when she bit down on it, but it didn't fall apart. "Perfect size for a smaller dog." Perfect size for a smaller dog. I thought that they would be made out of a softer type of plastic. Love the rope. "A little more durable from the Dokken Rhino dummies that I buy at Gander Mountain." A little more durable from the Dokken Rhino dummies that I buy at Gander Mountain. My dogs are tough on them though and the wear and tear is excessive. The brand that I bought from Gun Dog last about week to ten days longer. However, I do like the fact that the ones from Gun Dog already have a throwing rope attached. Thanks again for a good product. 2 minutes chewed the plug out? My dogs love them. We use them for water play, but the valves seem to fall out easy. Vizsla. Hunts. Family pet. Competes. I have to put this up after use. Bodie got into equipment bag and hid in his kennel and chewed up while I was at work. Good product. I buy them by the dozen. The dog loves the feel of them in his mouth, he can see them pretty well in the water, but he loves to chew the end off! I've tried the harder ones, but he doesn't like them at all. But for these prices, they are totally worth it. I would give this Throw Dummy five stars, except that it has a plastic valve plug which is easily removed; my dog has already pulled the valve plug out of the three dummies that I bought. And the valve seems unnecessary; why have one at all? Australian Shepherd. Family pet. Competes. Easy to through and hold up to my dogs hard mouth. Golden Retrievers. Hunts. Family pet. Competes. Nice basic bumper. Light weight, which lets me throw if farther, but easier to puncture if the dogs sneak a chance to chew. The valves are giving out, but I've had them for a while. A good value overall. They are awesome for training our younger dogs, we tend to buy a few at a time. Hard to lose them too! We also use them in the pictures in our ads and cards to demonstrate our dogs working ability.. If the dogs get a hold of them when we aren't looking they destroy the ends. It's really a pain. Savannah really likes her new retrieving toy. I bought both solid white and black/white combo. Easy to throw, easy to see in choppy water, and easy to hold. Only reason I rated it 4 stars is that I do not know how well the rope end will hold up as my pup likes to chew that end. Keeping that in mind, I pay more attention to her when she holds it for any extended period of time. Just wish it were made in the USA!! My dog loved it, but it lasted only 4 days before it was chewed beyond recognition. Then I found out from the breeder that both her hunting parents are chewers. She has just destroyed an "indestructible" Jolly ball. Any hints Steve? Have ordered several times in the past, maybe up to 300 retriever dummies, but this latest batch all had Yellow ropes. I hope that doesn't indicate the age of the dummies, and I hope that they will last about the average time. We will see. My dog is 11 weeks. Probably too much dummy for her at this point, but still holds up well. 2 of my dogs are aggressive chewers, and they chew up the bumpers very quickly if I don't take them away fast enough. "Price was great and worked well under normal conditions"
German wire haired pointer. Hunts. Con's Had two crack and split while throwing them onto frozen hard ground. The canvas dummies seem to hold up better during our tough Canadian winters. I like the product. I love the rope you supply with the product, it's the perfect length. Our dog often plays with one or two others. They all seem to prefer the Black/White dummy to the orange. Maybe it's easier to see the Black/White in the water. We use the orange in winter so we can see it in the snow. My dog was chomping pretty hard on other, larger bumpers, and I used these with some other training techniques to try and cure what was becoming a bad hard mouth habit. These softer dummies worked great in helping her realize that she didn't have to bite so hard to carry the target. My bumpers, as a result, are lasting a lot longer than I originally anticipated. Overall, I'd say this is a very good bumper for the price. Just what I was looking for at a great price. Haven't tried the water valve's out yet, but they have a good weight to them without the water. Wish it would have been a little more durable. Inexpensive. However, the plug does usually fail. Comes out. My daughters both have chesapeakes too. One of the dogs is a real biter. She usually will chomp hard on the bumper. She will go through the plastic. However, like I said the price is worth the abuse this dog gives them. I had these next to canvas bumpers in a pile and noticed the dogs actually sniffed through the pile for the canvas bumpers. Once the canvas bumpers were picked, then they would pick up the rubber ones. "My dogs all love to play with these when we go to the park." My dogs all love to play with these when we go to the park. They are especially great in the water. I meant to buy more when you had a sale, but never got it done. I will be watching for a good price so I can stock up. The only reason I did not mark excellent is because they do wear out quickly, but the price is pretty good so I just replace as needed. Thank you! Good basic training bumper. My dogs chew them when I'm not looking and any bumper gets a hole in it with that treatment. Yellow Labrador Retriever. Hunts. Family pet. Good weight for hand tossing and like the air valve feature. Great bargain for a great training dummy. Would buy again. Nothing wrong with it, I just have have a hard time 'loving' a dummy (again). Heavy enough to get some good flings. I love the Price and the Girlz love them! The only reason they don't get 5 Stars is they're made in China!! I had two received without the throw rope. Had to buy rope and add. No big deal. Otherwise they are great. brittany. Hunts. Family pet. Competes. I would like the rubber to be a little softer,but otherwise it is a great value for the money. Overall I like everything, After 4 years of use I had to replace the throw rope and some of them cracked at the eye of the bumper so they go into the blinds bumper bag. They are soft, sit low in the water and I added some water for extra distance and to keep the dog looking for the mark in the water. I think white is a good color and it has it place for training. They're bumpers, what can I say. Nice size for younger dogs. I chose the white ones. They clean easily, float nicely and have cords of adequate length to give a healthy toss. I purchased 5 dummies for training my two labradors. I one the dummies went flat on me and lost its round shape. 20% bad, 80% good. They do the job and last forever with a little TLC every now and again. I will continue to purchase Lucky Dog Dummies in the future. retrievers. Hunts. Family pet. Competes. Lucky Dog Dummy(s) withstand abuse, bought other brand and they cracked on the first throw. Its fine overall. Another inch or inch and a half on the throw rope would allow it to be thrown further. All in all a good product, however, at times the dummys with the valve on them have fallen out on mine. It's not a problem as I just use those on the land for marking instead of in the water where they would sink and be lost. Great for running blinds and just playing around. I would like to have some bigger bumpers, but they are to expensive. Good, inexpensive bumper. Valve leaks a little over time but nothing that hinders training. Kai Ken,Labrador Retriever. Hunts. Family pet. Overall, I'm a fan, especially given the price. The all white design helps my 10 week old puppy pick this bumper out when he has some problems with orange bumpers. Compared to the half-white/half-black bumper, I'd say the all white one is almost as good. It is sturdy with a nice thick throw rope that has stoop up to my puppy's chewing while he learns a soft mouth. The ribs are sized well to discourage a hard mouth in a puppy. My older dog doesn't seem too phased by them though. They work great and there is only one comment. I ordered several of these some white, white/black, and orange. Three of the 8 I ordered had leaky valves. You could hear air escaping when you squeezed them and also when the dog was retrieving them. I mostly use them without water in them but when I do I have to use the ones that don't leak through the valve. Overall good product and I would buy them again in the future if the need for more arises. Good - just don't leave them alone with a young dog, they will pull the plugs out. Boykin Spaniel. Hunts. Family pet. Dummy is a little soft and there is a plug a the top that the dog like to chew. "This is all you need in a bumper." Inexpensive, soft. This is all you need in a bumper. labador retreiver. Hunts. Family pet. Competes. Needs throw rope included otherwise good bumper. "Great value for the price." Seem to work well. No problems yet. Great value for the price. "He LOVES them still, so I am going to order more!" "Solid bumper. Dog seems to like it." Solid bumper. Dog seems to like it. The fact that you can weight the dummy with water through the valve at the top is a huge plus. "So far they work good and look like they are durable." So far they work good and look like they are durable. My dogs really like this black and white dummy. Even more than their bigger dummy, but they chewed the valve off in the first hour, and were able to chew the end off by the end of the first day. Not the product's fault. Lack of supervision on my part. However, they don't chew on the larger dummy for whatever reason. "She absolutely loves these dummies!" Sophie, our Lab, loves to chew these dummies if we do not immediately retrieve them from her mouth!!! She absolutely loves these dummies! A great decoy. My only complaint is: My dogs like to chew off the black rubber valves. I often find the decoys with the valves removed and later find the valves scattered on the floor. Problem is easily fixed with rubber cement. I've had good luck with the Lucky Dog dummies in the past. Most have lasted at least a couple years, and that's being used almost every day. The valves fall out very easily. I have lost 2 due to sinking already. Other than that they are great. "They are definitely his favorite. " I really like the weight of the dummy, the flexibility between soft and firm is great, the durability is is nice as well. but it doesn't seem to hold the air for a complete training session.But all in all i would and will purchase more. By the way, my dog always seem to pickup the "Lucky Dog Brand" first over other brands. They are definitely his favorite. Good product, but needs to be American made. Easy to use and holding up well. Would recommend for training any retriever. Works pretty good. However the weight of the transmitter could be a little heavier, so I can get a better feel for it. Air valves come out almost immediately and are lost. Are ok. They are rather lightweight and don't carry well in the string winds that we sometimes get in Oklahoma. I prefer a bumper with a little more weight to it. Irishwolf hound / English Pointer. Family pet. Not durable at all. After leaving the dogs with the dummy unattended for less than 5 minutes, the end was completely chewed off the rope end of the dummy. Good price and works pretty good. They flatten out and stay that way. I will buy more. Mainly like the dummies which don't have valves - durable and most are of a good weight for throwing. Don't like the dummies with valves - the valves always fallout after just a few throws. It's a pain to have to re-insert (if you find the valve) and again, it doesn't stay in the dummy. We are constantly squeezing out water in our dummies which have lost their valves. Also, the quality of the plastic appears to have gone done over the years - the dummies have thinner walls and are much lighter making throwing for distance more challenging. Thanks for taking the time to get feedback on these dummies. Dog chewed through it in 3 days. Also not a very active chewer. Not as durable as the other major brand of bumpers. Also the string is a bit skimpy. Sorry to say, it wasn't too difficult for them to chew it up. Bumpers are OK, lighter weight than I expected. Made in China. Not as durable as the ones I was replacing. When I called GDS they were very understanding and easy to work with. They sent me out a new batch of bumpers that day. The gentleman on the phone even said he would personally check to make sure that i was getting good ones. The bumpers arrived yesterday and they are much better. If my first transaction would have gone this way I would give them a far better rating. Good on you GDS customer service, you have certainly kept my business. Nothing really special about it. We used this dummy for play retreiving in our pond. It did not last very long with our dogs. We lost the black plug after a short amount of time, the rope fell off, and because they were mouthing it quite a bit, the plastic quickly cracked and it sunk. We like the Avery brand much better! The 3 Avery ones that we started using early in the spring are still floating! My almost 2 year old lab chewed the valve off (and swallowed it...) as well as the rope and piece that the rope goes through. This all happened within 5 minutes. 3 stars only from me. He chewed through the rope in the first day, and actually ate some of the plastic that came out in his poo. I don't allow him to use it as a busy bone either. That being said, it's a great throw tie. Nice balance and throws far. Too soft and chewy. Dog has already chomped through several, and they are only a week old. Just not durable enough. Valves ripped out and don't float anymore. Not the quality I expect or would accept. Good size and functions fine on land, but the valve on it never worked on it from the beginning, so when it is used in water, I have to squeeze out the water after training. Unfortunately these buoys don't work for my dogs too good. They pull those stoppers out; they sink! It is really easy to throw, the rope is just right for throwing, the dog loves to fetch it. The dog had the black valve chewed off in 10 seconds and was working on the thin area where the rope attaches with 90% success. Now it doesn't float. Not durable enough for a Lab. Too close to the material of a "chew toy". The regular canvas ones work much better. It seems you have changed manufacturers because the latest bunch i got seemed smaller in size and the rope was not as long either. This made them difficult to control the toss. I prefer the longer size (11 inches). I think one time there was no rope and I bought some clothesline to make my own. My 10 month old lab chewed it to pieces. I need something not so easy to destroy. The bumpers are rugged however the weak link is the valve that allows you to fill the bumper with water for weight. If the valve gets removed/falls out, the bumper will fill with water and sink. I recommend getting the bumpers without a valve. All the valves came out. The valves that didn't come out immediately I glued in, and they still came out. Also after 2-3 years they are now breaking apart. The bumpers are nowhere near the quality of the original US made product. They are lighter weight and don't throw well. If you add water the valve doesn't stay closed so that isn't much of an option. The eye pulls away from the body and one of them split right down the middle after minimal use. One of the Dokken's also split down the middle. So I guess sales are up due to requiring replacements more frequently. I have to buy some replacements. Any suggestions? Bumper itself is fine, in the sense that it is rubber and has a rope, but the black portion is done with cheap paint. After just one use a very large portion of the paint came off. This is unacceptable and i will be contacting the GDS in the morning to arrange my refund or exchange. If you are looking to have a bumper that is going to just end up being all white just save the heart ache and order them that way. Very disappointed with this product. Ordered 22 Lucky Dog Regular Plastic Dummies for training. Over half of the black air stems have broken off then they fill up with water. Would not purchase again. I didn't realize until I got them that they are made in China. I don't trust plastics made in China. I'm returning it. I would prefer to have a product produced in the US. He was able to break each dummy into little pieces in a couple minutes. He has a hard mouth but this was happening on retrieves right out of the box. Check valves poped out. Not good in water any longer. On the second retrieve the dog broke the area where the rope goes thru. Now we can only throw it by the dummy, not the rope. These SportDOG dummies are the soft, rubbery type plastic dummies preferred by many professional and amateur trainers.